Over the last few months, the Azure Redis Cache team has released a number of enhancements to the service. These enhancements were driven by customer feedback. This post is an outline of the changes released. We hope you will find these improvements helpful. Import/export is an Azure Redis Cache data management operation which allows you to import data into Azure Redis Cache or export data from Azure Redis Cache by importing and exporting Redis Cache Database (RDB) file(s). This enables you to migrate between different Azure Redis Cache instances or populate the cache with data. Add dump import to redis cache and Take snapshots of the cache for download were suggestions on the Cache UserVoice feedback forum addressed with this release. For more information on how to use this feature, please see this article. You can configure amount of Redis databases and set flags (hash-max-ziplist-entries) to optimize memory. To learn more about Redis memory optimization please see this guide. Note: Changing these flags to optimize memory may impact performance of your Redis Cache. This requires a good understanding of how Redis works and should be used with caution. This update addresses the following suggestions on the Cache UserVoice feedback forum. For more information on what properties you can set, check out this article. You can set these properties using Azure Powershell, CLI or Management libraries. We added an option to enable diagnostics through PowerShell. You can use "Set-AzureRmRedisCacheDiagnostics" to enable diagnostics on an existing Redis cache. We added Keys (Total/Expired and Evicted) counter. We also added a Redis metrics option which allows you to see all the available counters you can use to monitor your Redis cache. 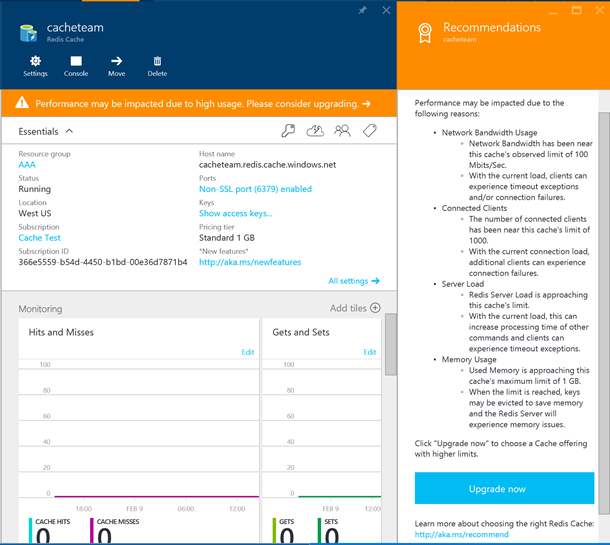 Azure Redis Cache Advisor is a recommendation engine we built as part of our offering. Redis Cache Advisor monitors the health of your Redis Cache and will suggest recommendations if it detects your app’s performance may be impacted. This engine works even if you have not enabled diagnostics for your Cache. A common symptom for performance being impacted is timeout exceptions in the client's app. These exceptions can happen due for a variety reasons. One example being that based on current usage the Redis Cache could be exceeding recommended thresholds of network bandwidth. This table has more details on the recommended thresholds for network bandwidth. This work was largely driven by our observation that users were not aware of the impact of exceeding these thresholds on their apps performance. The following screenshot shows this Redis Cache exceeded the recommended thresholds for all performance counters. For more details, please see this article. Azure Redis Cache has a broad global reach and is available in all regions in Azure. This includes Azure China and Azure Government. For more details, please visit this service availability document. Azure Redis Cache has been certified for various compliance standards, most recently, the Payment Card Industry (PCI) Data Security Standards (DSS). You can find the list of all certifications and attestations Azure Redis Cache has been certified for or the Microsoft Trust Center. If you are new to Microsoft Azure or Azure Redis Cache, we invite you to try it out by creating your free Azure account and getting started with Azure Redis Cache. Please provide us feedback through the UserVoice page on how we can improve. If you need help or have questions, visit us on MSDN or StackOverflow.